It’s usually the “simple” inventions that make significant impacts on our daily lives, and Scotch Tape is no different. Quite often, these simple items have a detailed, interesting history. The Minnesota Mining and Manufacturing Co. (3M) was founded in 1902 by five businessmen seeking to mine a mineral deposit for grinding-wheel abrasives. With its first venture ending in failure, the company quickly moved from Two Harbors, MN to Duluth, MN and changed its focus to sandpaper products. Little did the founders know, the company would later launch a product line that would be used in millions of homes and businesses. In 1925, Richard Drew, a 3M mechanical engineer, invented masking tape when he saw auto-body workers’ frustration after removing tape on cars they’d just painted. The adhesive holding butcher paper was too strong and would often strip some of the paint they’d applied. Later, Drew addressed another issue – the need to seal cellophane without water. Drew invented Scotch Cellulose Tape in 1930, giving bakers and grocers a quick, waterproof method to seal packages. Soon, Scotch Brand tape would enter the household, allowing us to make simple fixes to a variety of items. The first countertop tape dispenser, introduced in 1932, was made from cast iron. It weighed nearly seven pounds! Seven years later the company produced the “snail” – the handheld tape dispenser. The initial version was made from stamped sheet metal, with a plastic model emerging in 1940. During WWII, most tape production was diverted to the war effort. 3M developed and manufactured more than 100 different types of tape to solve issues, including Scotch Double-Sided Tape. Post-war, 3M focused on marketing Scotch Brand Tapes to homes, schools and businesses. The brand’s packaging, like many others in the ’30s and ’40s, was quite bland. Rolls of tape would be sold in metal containers with an ever-changing “3M” logo. The plaid design we know today wasn’t revealed until1945. 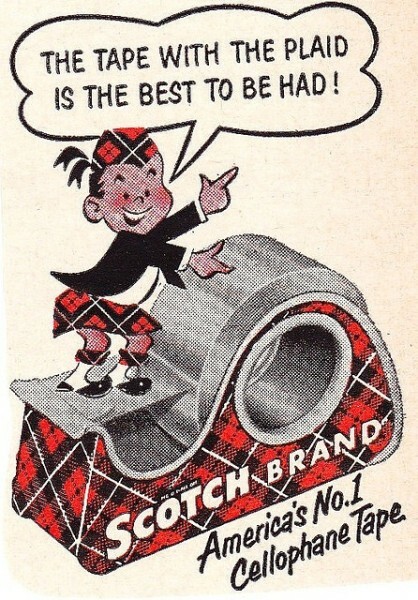 In the ’50s, 3M introduced Scotty McTape – a plaid-dressed mascot for the Scotch Brand. His oft-spoken slogan – “The Tape with the plaid is the best to be had!” – helped make Scotch Tape a household name. Scotch Cellophane Tape became a major television advertiser and Scotty appeared in its various marketing efforts until the 1970s. In 1961, a matte-finish tape was invented and released as Scotch Magic Tape. Soonafter, the initial Cellophane Tape was renamed to Transparent Tape. Through the ’70s and ’80s, 3M – now a leader in the tape industry – continued to combat many needs by introducing Removable Tape (1984) and other types of adhesives. In 1985, a Roper opinion poll revealed consumers saw Scotch Tape as a most indispensable household product. 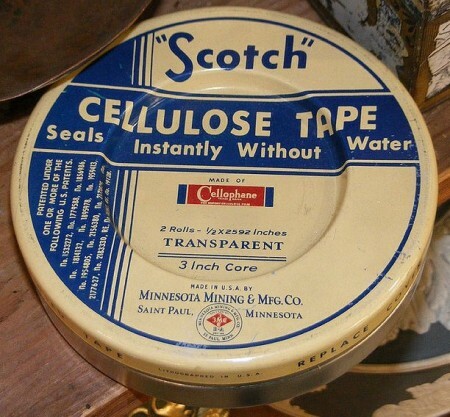 Scotch Transparent Tape was one of the most popular types, up against aluminum foil and no-iron fabrics. In 2004, the Museum of Modern Art (New York) called Scotch Transparent Tape a “humble masterpiece”, and spotlighted it in an exhibit of more than 100 simple items that are “deserving of our admiration”. Among the company’s latest tapes are types geared toward crafters and those seeking to better preserve vintage memories. But it all started with failure… and the hiring of a brilliant engineer. And, like most successful products in the ’40s, ’50s and ’60s, print and television advertising played a major role in brand recognition. There’s just something about watching vintage commercials about products that would later become a staple in every household. It’s advertising like this that changed people’s lives by introducing simpler ways to perform regular tasks – like wrapping gifts and, as the commercial says, “mending things, like torn sheet music”.